A huge number of entries meant that we needed two test areas. This necessitated a 7.00am start for the 'Horsham boys' in the rain armed with strimmers, gloves etc. to clear the test site � well done lads, you did a grand job! 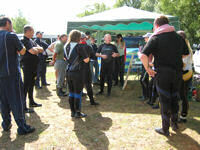 The weather improved rapidly as the day went on and we ended in warm sunshine. 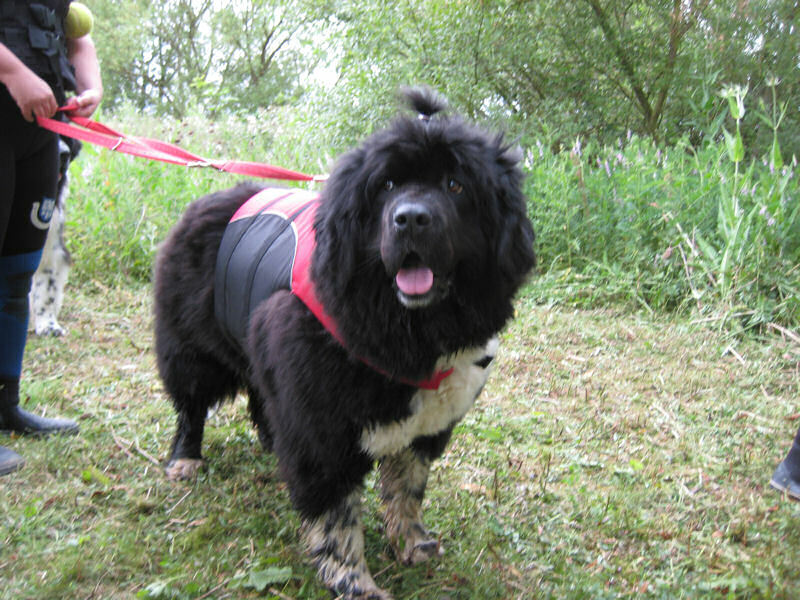 Dogs ranged in age from bouncy puppies of 6 months to sedate veterans in their teens � they all enjoyed their day out. 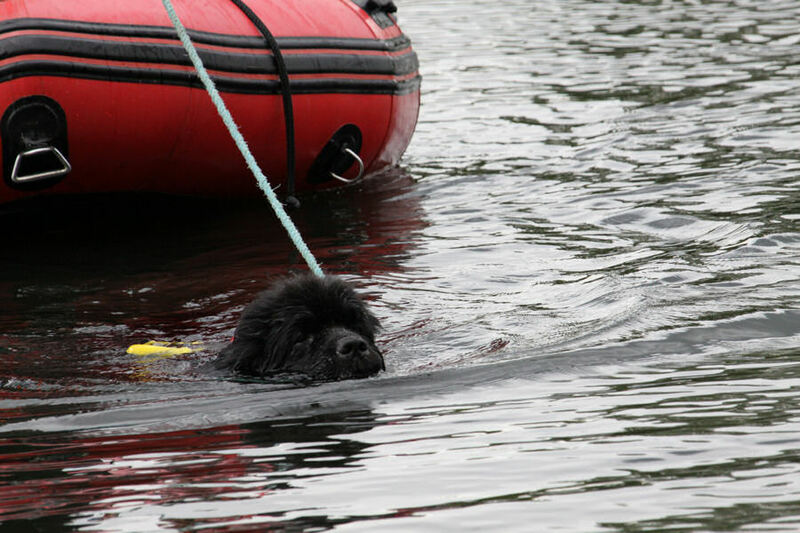 We were pleased to welcome two dogs from Belgium and it was interesting to learn how their training methods differed from ours especially the boat jump and tow. Sections A and C ended with an almost 100% pass rate. Passes in section B were very few but included a junior handler showing the grown ups how it should be done. Thank you to all the judges and to the entrants for being ready at their allotted time that resulted in an early finish. Huge thanks to Horsham Newfs for all their hard work all day. Constable's Culnor Be Cool "Daisy"
Scott's Moonlight of Krakow "Harry"
Lord's Mileoak Rince Ri "Amazon"
Hewson's Nereides Lady Of Soul "Ftse"
Vanlanduyt's Harbourmasters Zion Beauty "Gioia"
Hewson's Paradeso Silver Dollar "Dollar"
Coleman's Chateaunewf Out Of The Blue "Tiye"
"First of all I would like to thank the Southern Newfoundland Club for inviting me to judge at this lovely venue. Secondly big thanks go to the Test Manager Angie Mercer and the rest of Horsham Newfs for their hospitality and keeping us fed and watered all day. A good entry of 16 dogs, with 1 being absent on the day. 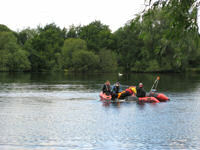 The weather was lovely, with not too much wind so there was only a slight drift to contend with. We had 13 good passes from dogs varying from 6 months through to 10 years and they all worked well. The oldest and the youngest entrants completed near perfect tests with the puppy carrying out a hand tow which was lovely to watch, congratulations to Daisy and Nala. We had some other excellent first time passes and I'm sure all these dogs will go on to do well at the next level very soon. Unfortunately two dogs failed the test today, both on the retrieve exercise, which was a real shame as they had both completed the first 2 exercises well. All the dogs did really well, but on occasion it was their handlers that very nearly let them down! PLEASE remember that if you double handle a dog you will fail an otherwise good test! 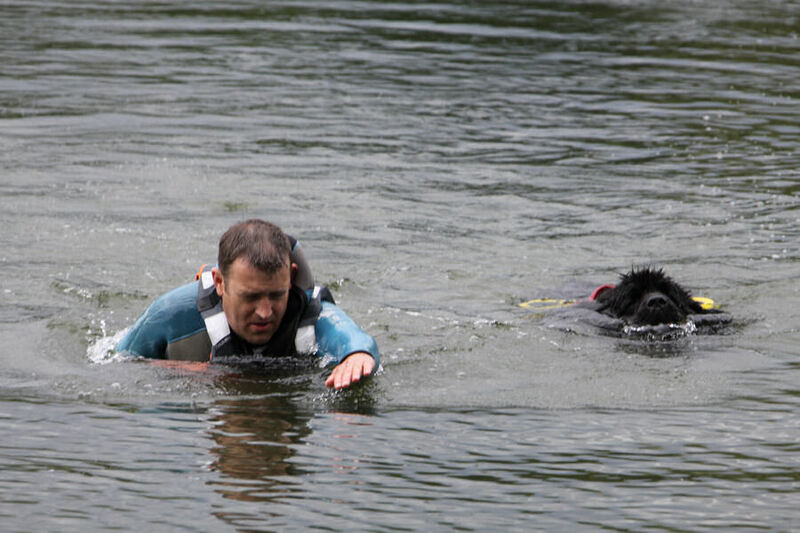 I know that when there are 2 of you working a dog in sections A & B it can be tempting to double handle, just remember whoever sends the dog must collect the dog, and the other person cannot interfere until the exercise is complete! 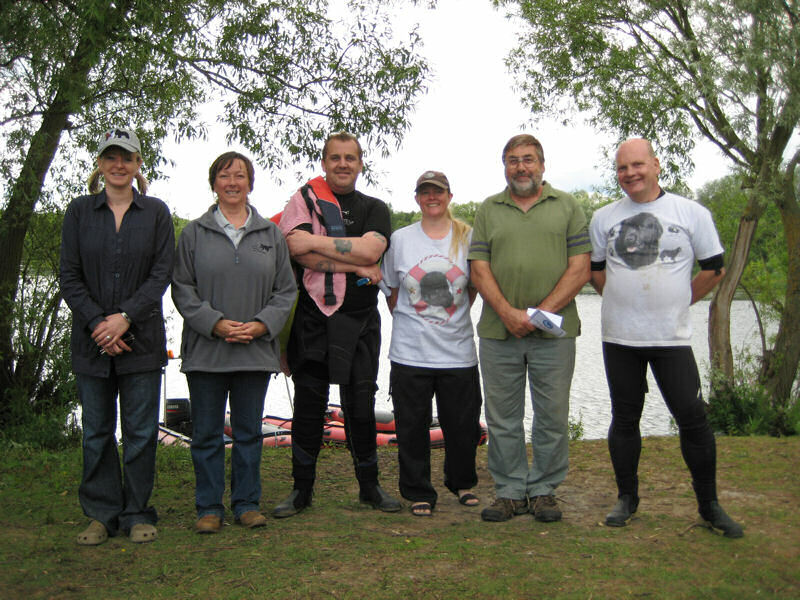 Lastly, but importantly, thank you to the boat handlers and stewards for doing such a great job, and of course to my co-judge Rachel for an enjoyable test." "15 dogs entered and 13 fabulous passes. 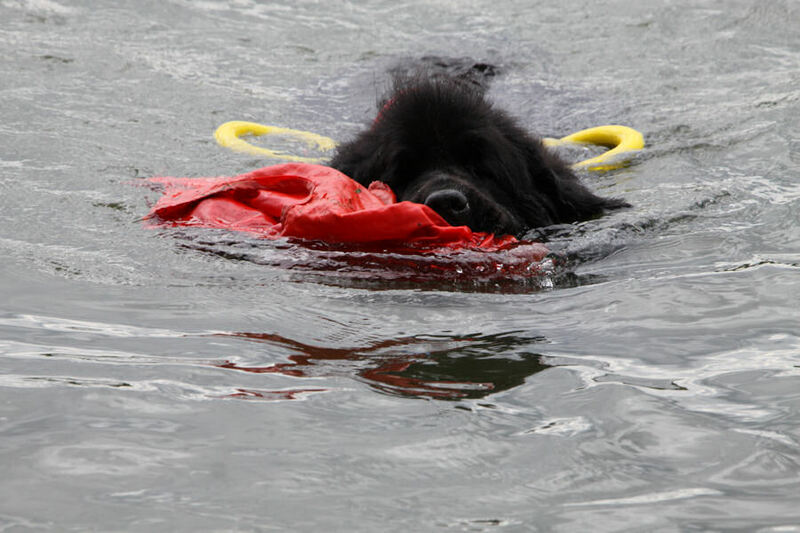 Both dogs who didn�t pass did the first exercises beautifully but one did not want to go out to retrieve the article and the other got part way out but then returned. Both dogs are quite young and will get there with encouragement. 4 dogs who passed were under one year old and all were enthusiastic and enjoyed themselves which was lovely. The 3 veterans entered also did lovely exercises and it is so wonderful to see them still enjoying themselves. A well organised event which was very enjoyable to judge at. 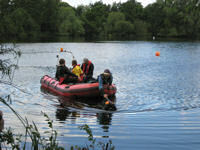 Thankyou to the Horsham group and all attendees who make these days such fun. " Johnson's Sparkybears Two Shoes among Piratebears "Cru'ella"
Mackillican's Mileoak Whispered Secret "Daisy"
"Test Manager Angie Mercer, once again put on a well organised and well run test. 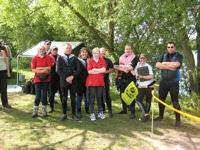 The Horsham Group provided our stewards, all of whom were as always, good humoured and very helpful. 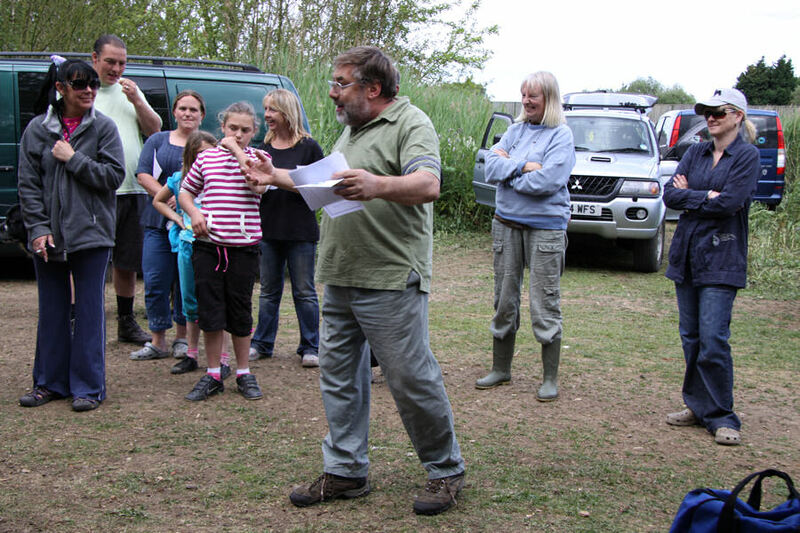 My thanks to them and to my fellow judge, Colin, for making the day a really enjoyable one. 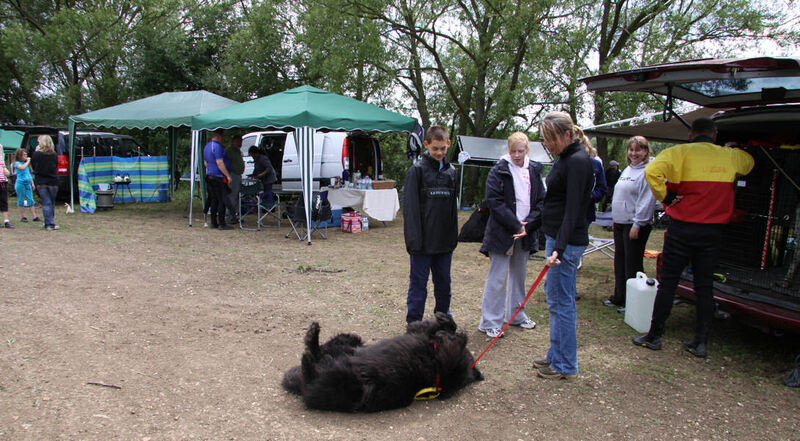 We had twenty entries for Section B, and as only two of these did not take part, we judged eighteen dogs and handlers throughout the day. It was disappointing that out of eighteen teams only four passed but, I am afraid the safe swim and underwater retrieve were the elements responsible for the majority of the failures. 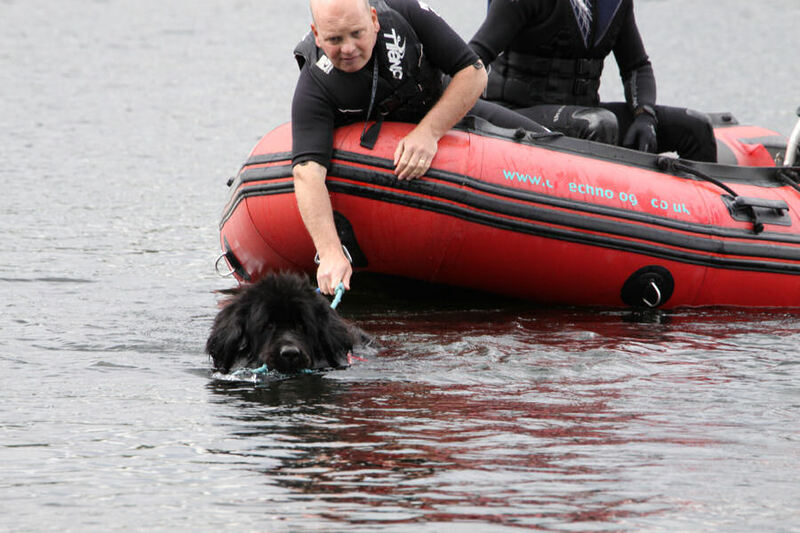 I hope all the handlers and dogs continue to train as a team to achieve this level, as I know they will have all benefited from experiencing the tests under different conditions and at a different venue than their own training areas. 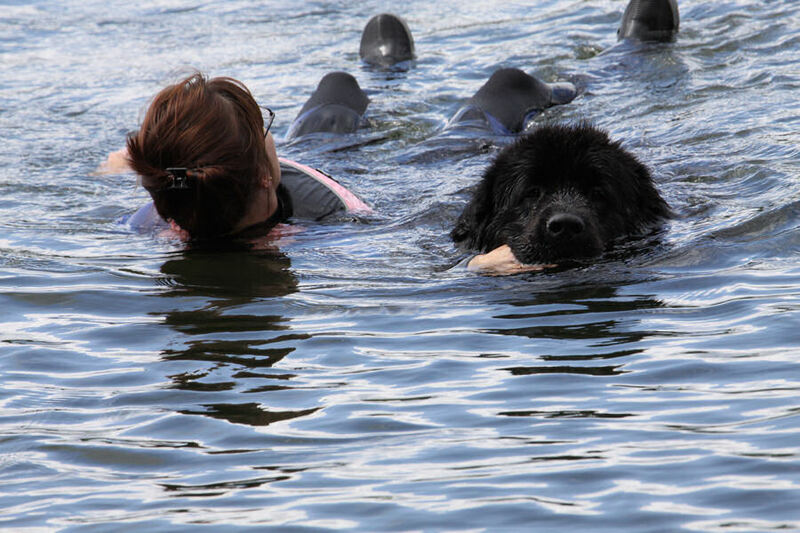 Congratulations to those who did pass, with a special mention to the junior handler team, it was great to see the future of our Newfoundland water training in such good hands." Hill�s Honeybears Funny Girl "Maisie"
Johnson�s Sparkybears Two Shoes among Piratebears "Cru'ella"
Hill�s Hanningfield Princess Leia "Ruby"
Abu-Jabir�s Smithers Glory Pays "Maska"
"The weather was excellent with a slight breeze but this did not cause any problems for the stewards or dogs. There was a large entry so members of HWN arrived early to clear a path to a second test area so that the tests could run simultaneously. 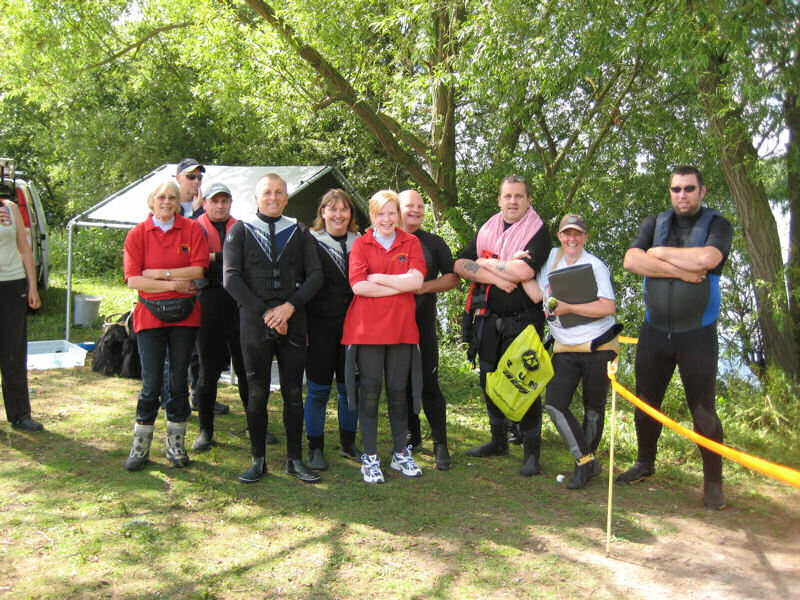 There is quite a steep entry to the water at Egham, which by the end of the day became very slippery but everyone coped admirably. The standard was incredibly high with 6 entries in Section C of which 5 passed. One dog completed a perfect test and lost no points at all. I have judged 339 dogs to date and this is the first time I have judged a team and not deducted any marks. There were some excellent displays of verbal redirection from other entrants, which will help significantly when attempting higher levels. A couple of the entrants could do with tidying up some elements but had no real issues. 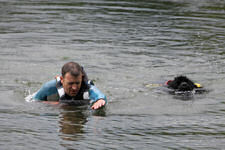 The dog that was unsuccessful passed all the exercises with the exception of the safe swim and that was only because they could hear their owners voice in the other test area. This high quality entry was a joy to watch and judge. Thank you to my fellow judge Pete Webber, the Test Manager Angie Mercer, stewards and members of HWN for all their hard work throughout the day." "With out a doubt what a great test to judge at. The weather was warmer than last year with no wind, Horsham Newfoundlands Group had worked hard to prepare the ground for the test and both swims worked ok.
My pleasure from this test was the very high standard dogs worked at their different exercises and in all my judging experience I have never had a dog not losing a point. My surprise also was a dog from Belgium and again great to see different training methods and commands to complete the test. We had 6 entries and sadly 1 failed due to the safe swim which was due to the dog distracted by the owners voice in another swim. 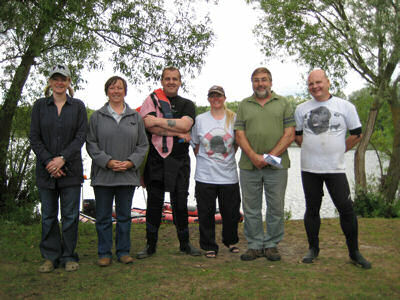 My stewards worked very well as a team and big thanks to Cheryl who was my wet stranger. Angie as test manager and Kevin as my co judge made the whole test run smoothly."